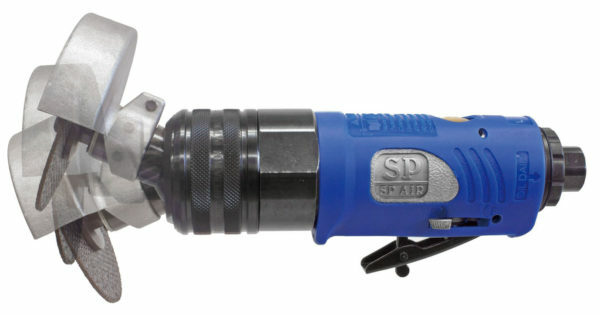 The SP Air Flex Head Cut-Off Tool, No. SP-7231, is lightweight and features a three-position flexible head for access to tight work places. The tool has an ergonomic design with a cushion grip handle, rear exhaust, safety throttle lever and built-in power regulator. It has a direct drive motor with a graduated trigger and a metal guard for safety. 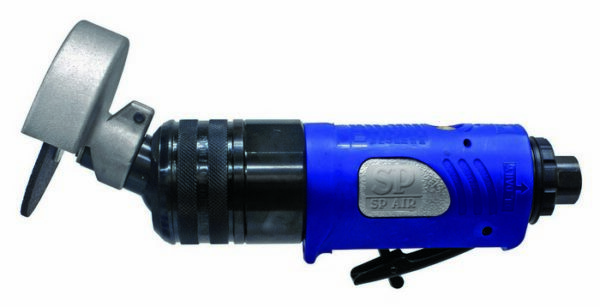 The SP-7231 can cut muffler and radiator clamps, bolts, sheet metal, fiberglass and steel rods up to 3/4”. 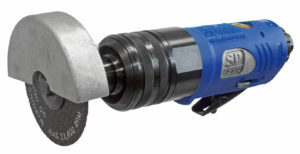 The cut-off tool has an overall length of 8.6”, weight of 2.6 lbs, free speed of 18,000 rpm and air consumption of 4 cfm. Made in Japan. Finding tools that work effectively for a certain job can save technicians time and frustration. 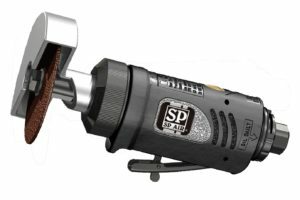 The reviewer found that the SP Air Flex Head Cut-Off Tool was a well-made tool but it won’t fit every technician’s needs. Brian Noel, an automotive professor at Cosumnes River College in Sacramento, Calif., likes that the tool has a metal shield rather than a plastic one, so it will not be destroyed over time by sparks. He also appreciated the built-in regulator and adjustable exhaust. “While the tool itself is bulkier than many cut-off tools, the flex head allows it to pivot in different positions, which can increase its maneuverability and utility in some situations,” he says. Noel and his students used the SP Air Flex Head Cut-off Tool primarily in a classroom setting for cutting sheet metal, metal brackets and general fabrication. For that application, this cut-off tool was bulkier than other options, and the flexible head wasn’t necessary. “I could see this tool being very appealing to someone in the collision repair/custom fabrication side of the industry, as it would likely make long cuts in body panels much easier to achieve without awkward positioning of the user’s body or hands,” Noel says. Noel found that the tool operated similarly to other cut-off tools in most situations. Using the flex-head feature was as easy as sliding the collar and pivoting the head accordingly. The tool did require some setup. Like any air tool, the Flex Head Cut-off Tool needed a quick disconnect fitting installed. A cutting wheel also needed to be installed along with the included shield. Noel adds that, if desired, a built-in regulator can be added to adjust the speed and power output of the tool. The cut-off tool and shield were boxed along with wrenches to hold the mandrel while installing the cutoff wheel. There was also a one-page brochure about the tool and a generic booklet of precautions applicable to all air/pneumatic tools. As an improvement, Noel notes that ideally, the tool would have the flex-head and still be able to maintain the slimmer size of other cut-off tools. Overall, Noel found that the tool was well made and designed, and could work in a variety of applications.